I've been using Poweramp for a long time now. Never had real issues until recently. Don't know if it's because of the update or my phone. I usually have it on shuffle all tracks. Recently it will get stuck on the last album it played and only shuffle songs from that album. Then I have to go back, choose a different category like album or folder, choose a song randomly play it and shuffle will work for a little while. This is really annoying and dangerous while driving!! As far as I know, that should only affect playback when you use the Shuffle button at the top of a library view page. If you only ever launch a song by tapping on it directly, and then use the Shuffle icon within the Player screen, it should do what it is told and correctly set the shuffle mode as indicated. @phangtonpower what do the metadata line displays tell you - that should let you know the playback mode and next planned track, etc. What Repeat mode have you got set? 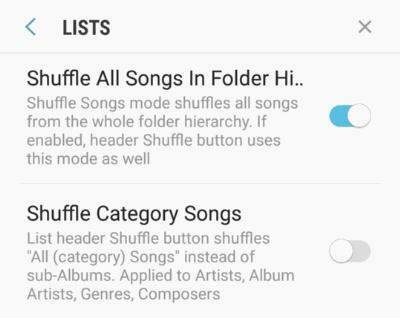 It does sound like a combination of Shuffle being set to Songs Only (rather than All Songs) and Repeat set to Repeat List. There isn't anything in the Queue which could be affecting your upcoming playback order is there? I don't have repeat on, shuffle is set to all, I have nothing in the que. The first time I noticed, I searched for a song in library. The next day it would only shuffle songs in either the same album or band folder. The only thing that seems to work is to go back library, I usually choose album, pick the first album and song, and skip track to see if it shuffles. It works, but maybe a day later, it will get stuck on the same folder or album that it last played. Also when it first started happening, I would do the above steps, but then it would go back to the first band that I searched for when I noticed it happening. Another thing that I forgot to mention in my op, and this maybe the phone I use, is when I plug a jack in, it wont start Poweramp like it used to. I have it set to "resume on wired headset". Sometimes it will come on for a second and cut out. Maybe do this a couple times, but only thing that works is to open my phone go to the Poweramp widget and press play. The first time I noticed, I searched for a song in library. Ah, you didn't mention Search. That can apply special playback conditions in the same way that the Shuffle icon at the top of lists does. I would have thought that manually cycling through the modes using the Shuffle icon should clear those though, and certainly going back to the library view and restarting playback from there (by tapping on a specific song) will do. And what exactly happens when you have this issue? Could you post a video of the problem maybe, including tapping to cycle through the metadata line so we can see what modes are in action? The issue is I always have it on shuffle all, but sometimes randomly, maybe a day later, two days later, can't really say, but it will only shuffle songs either from the same album or a bands folder that it last left of on. I have to reset the shuffle. It's annoying because I don't even realize it until I'm already driving. I'll try and skip to a different song, but will only shuffle within a band that it's decided on. I can take a video, but I'd have to wait when the problem occurs. Plus I really only use it while I'm driving and wont be driving for a while. Started happening after it upgraded. Never had issues with it for the 6+ years I've been using this app.